Jarhead: Oscar winner Jamie Foxx (Collateral, Ali) and Jake Gyllenhaal (The Day After Tomorrow. Donnie Darko) star in this critically acclaimed portrayal of a group of young "Jarheads" during the explosive days of the Gulf War. From the Academy Award-winning director of American Beauty. Jarhead is a powerful story, told with painful honesty and irreverence, with spectacular cinematography. Jarhead follows 'Swoff' (Gyllenhaal) from a sob..
Battle-scarred and disillusioned by the war, Corporal Chris Merriman is put in charge of a unit whose next mission is to re-supply a remote outpost on the edge of Taliban-controlled territory. While driving through the hostile Helmand province, a Navy Seal flags down their convoy and enlists the unit on an operation of international importance: they must help an Afghan woman, famous for her defiance of the Taliban, escape the country. W.. Assigned to protect a seemingly safe U.S. Embassy in the Middle East, elite Marine Corporal Evan Albright (Charlie Weber) thought he wasn't going to see much action. But when a hostile, extreme militant group launches a surprise attack aimed at killing an Embassy informant, Albright's team is caught off guard. Out-gunned and outnumbered, Albright's routine assignment escalates into an all-out war. With national security at stake, an int..
Academy Award-winner Jamie Foxx and Jake Gyllenhaal star in this critically acclaimed, brilliantly unconventional war story from Oscar-winning director Sam Mendes. Jarhead (the self-imposed moniker of the Marines) follows Swoff (Gyllenhaal) from a sobering stint in boot camp to active duty, where he sports a sniper rifle through Middle East deserts that provide no cover from the heat or Iraqi soldiers. Swoff and his fellow Marines susta..
Oscar winner Jamie Foxx (Collateral, Ali) and Jake Gyllenhaal (The Day After Tomorrow. Donnie Darko) star in this critically acclaimed portrayal of a group of young "Jarheads" during the explosive days of the Gulf War. From the Academy Award-winning director of American Beauty. Jarhead is a powerful story, told with painful honesty and irreverence, with spectacular cinematography. 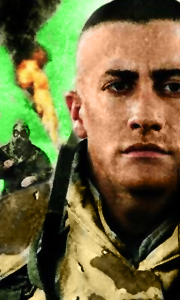 Jarhead follows 'Swoff' (Gyllenhaal) from a sobering sti..